Step 1: Create a digital destination for the release. 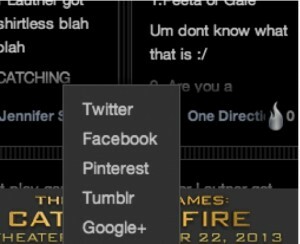 In the case of Catching Fire, it’s Hunger Games Explorer. Step 2: Collaborate. The Catching Fire team partnered with Internet Explorer to create a custom site that puts fans in the driver’s seat. The lesson here is about legitimacy and broad awareness. Partnering with a tech company on a tech product helps give the project credibility and an innovative feeling. Plus, two companies sharing the same message can reach a much wider audience than one. Step 3: Show ‘em what’s coming, but don’t actually show ‘em just yet. To accomplish this, a YouTube video of the teaser trailer was embedded onto the site…but marked as private. Here’s what users saw when they clicked ‘play’ (As soon as the trailer aired for the first time during MTV’s Movie Awards, the clip was made public and viewable on the platform). Step 4: Track the real-time conversation surrounding the event. The digital marketers at Lionsgate did so by adding a widget to the site, which captured real-time social media posts tagged with #TheSpark. Step 5: Let your fans tell the story. This is arguably the most important lesson for brands, because you don’t need to release a movie to accomplish this. You just need a great piece of content and a group of social ambassadors to amplify your message. 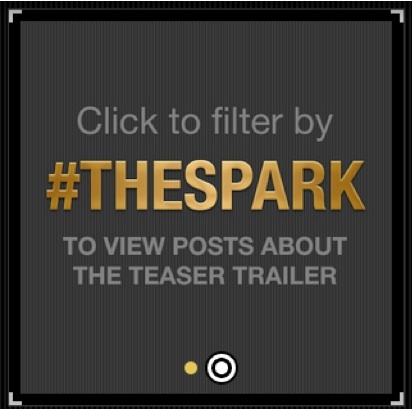 The Hunger Games Explorer allows users to sort content and #TheSpark posts by ‘official updates’ or ‘fan sites’ and enables on-platform social sharing across all the major social networks – not just Facebook and Twitter. Integrating Tumblr was a specifically savvy move, as the marketing team clearly knows that millennials are a huge target for this film, and a demographic that over-indexes on Tumblr, both in terms of membership and activity. Bottom Line: Even if a multi-million dollar motion picture starring an Academy Award®-winning actress isn’t on your brand’s marketing agenda this year, you can still learn from this social experiment and create your own social spark. This dedicated digital home for The Hunger Games fans will let them track every development in the franchise, including fan blogs, talent tweets, exclusive images and videos. The site will serve as a social aggregator, allowing both official and fan-generated content to be pulled from multiple social media platforms. Users will be able to search, filter and share content directly from the site, providing an incredible experience for utility and discovery. Built with Internet Explorer 10, The Hunger Games Explorer takes full advantage of multi-touch technology, letting visitors swipe and scroll through content with the flick of a finger. Another feature called “sparking” lets fans “like” objects while driving discussion around each bit of news or fan-created content.